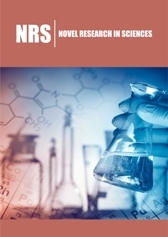 Novel Research in Sciences (NRS) is a scholarly international journal peer reviewed journal that publishes scientific research & Reviews into the practice of Science. Our scope includes articles that address issues with tools from foundational fields such as computer science, economics, mathematics, operations research, political science, psychology, sociology, and statistics. NRS is an multidisciplinary research that reflects the diversity of the management science professions. Our interest extends to managerial issues in diverse organizational forms, such as for-profit and nonprofit firms, private and public sector institutions, and formal and informal networks of individuals. NRS invites publications on all the topics focussing on ongoing researches and its applications, and also the contributions dealing with the practices of social, economic and political issues on conservation management, in the form of Research papers, Reviews, Case reports, Editorials, Comments and as well as Perspectives.